Sadness has officially hit me. We have come to the end of our beloved Dawson's Creek viewing pleasure. And boy was it indeed "viewing pleasure". With the end finally here, I felt...lost almost- no, not lost- bad word for it. Let me think for a second...I felt... like a weight had been lifted off my shoulders while having a new one set right back on at the same time? Make sense? No. Hmm, let me explain. I started watching DC (you're ok with me calling it DC, right? Cool.) when I was 13. Maybe 14. Anywho it was my show. I had the posters, I had the soundtrack, my parents knew that every Wednesday from 8-9pm I was NOT to be disturbed. Those characters became my friends. Then come season 3 (so you know, 3 years into this friendship) I found out what boys were and became too cool for DC (sad, I know). There has however always been this sort of unending unsettled "what happened?" that has haunted me since. I never finished the show. I never found out if Dawson and Joey ended up marrying and making a quazillion babies...or was it Joey and Pacey? And Jack! What happened with him...and Jen! You get my point. So you can imagine my delight when 13-14 years later I find out it's on Netflix. I dove right in. Head first. I begged my husband to join- he reluctantly did. It became a nightly thing we'd do- reunite with these old friends of mine and find out what exactly did happen. Some nights we'd have "marathons" and watch unthinkable (unmentionable) amounts of the show. Haha. It was fun. 128 episodes later (each being 44 minutes or so) we finally reached the end. I almost didn't know how to feel. I was happy, relieved almost. I finally knew the end. Finally had some resolution. But then there was a new sadness. It was over. Like, over over. And can I just say...off the record...I HATED the series finale? Not only was it maybe the saddest thing I have ever volunteered my eyeballs to be a part of, but the very very very ending- LAME-SKIS! I don't want to give away any spoilers- so I'll keep it at that. But the hubbie and I were definitely hoping for a different end, ifyaknowwhatimean. So what does any insane woman reliving her adolescent years do after having "her show" end? Bake. Bake and bake and bake. Bake things that are warm...and comforting...and yummy...and will almost erase the sadness said show has left. Eating away my feelings? No, never. Dramatic much? Absolutely. I don't care that desserts like this typically hit the "popular" list in the Fall. I'm making them now. Because they're good. I love this tart. I love it because it's not a tart nor is it an apple pie- but it's trying to be both. It's deliciously trying to be both. I give it mad props for that. I almost wanted to call it, the "Not an Apple Pie, Nor a Tart Apple Pie Tart" but then I thought, "why?" So I didn't. Some things are only funny in your own brain while you're late night blogging alone with The Black Keys playing on Pandora. Name drop, name drop, name drop. Crunchy phyllo is alternated with layers of browned butter and ground almonds. 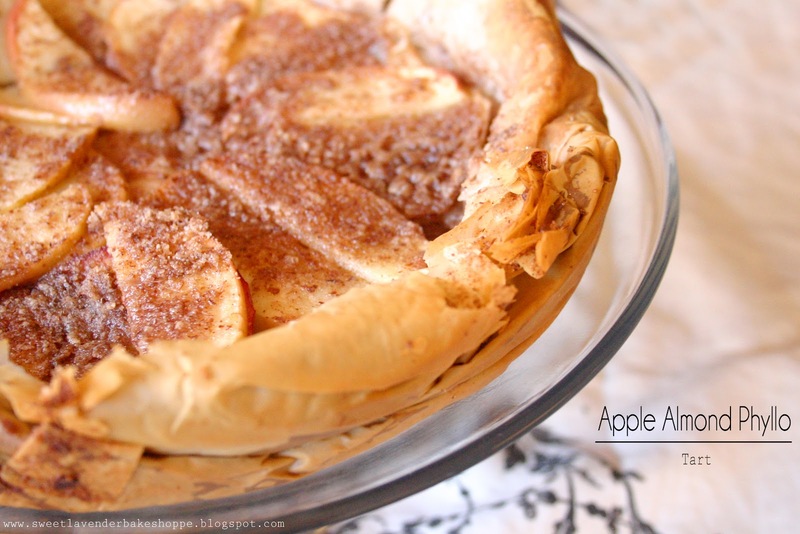 Tart juicy apples are then topped with vanilla sugar and spicy warm ground cinnamon. There's more browned butter involved. And more vanilla sugar. It's heavenly. 2. Combine almond meal, sugar, and cinnamon in a small bowl and set aside. 3. Lightly grease a 9” cake round and place it on a cookie sheet. 4. Brown your butter- melt over medium flame in (preferably non-stick) pan. Once completely melted, lower flame to low and continue to cook until the butter starts to froth. Once the froth starts to die down you'll see it browned (and smell totally nutty!) You're done! Take off heat and set aside. Total time- about 5-6 minutes. 5. Start with 2 phyllo sheets on top of each other. Brush browned butter all over the top (second sheet) phyllo dough and sprinkle almond mixture evenly over top. Repeat this process 6 times- this time using one sheet of phyllo per layer. Top with remaining phyllo sheet, and brush it with all but 2 tablespoons browned butter. 6. Take prepared phyllo dough and add to cake pan. Press gently into bottom and sides of pan and tuck over-hang into itself (almost like a pizza crust). Core, then slice apple about 1/8" thick and remove any seeds. No need to peel. Arrange apple slices in spiraling layers on top of the phyllo, brushing with reserved 2 tablespoons butter and sprinkling with sugar/cinnamon between layers. 7. Bake, rotating cookie sheet halfway through, until phyllo is golden brown and fruit is soft, 28 to 32 minutes. Let cool slightly. Cut into 8 pieces.